Another student gives up on school every 29 seconds, resulting in more than one million high school students who drop out of American high schools every year*. Nearly one-third of all public high school students fail to graduate from high school with their class*. Students in West Virginia lost more than 43,000 credits during 2010-11 alone. Schools and school systems are searching for new and innovative ways to help students stay in school and on track for graduation. Credit recovery through the West Virginia Virtual School is one such solution. Credit recovery provides students an opportunity to recoup credit from failed courses required for graduation and develop skills and work habits that will contribute to their continued academic success. It differs from initial credit acquisition in that students focus on mastering content, not on meeting requirements for seat time. 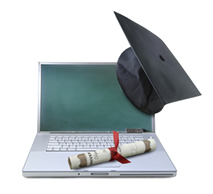 Courses for credit recovery are not remedial courses; they are not watered-down or shortened. They are the same rigorous courses students take for initial credit. They have been evaluated by subject matter experts and aligned to West Virginia Content Standards and Objectives and the Southern Regional Educational Board Standards for Quality Online Courses. These courses offer thorough diagnostics, flexible pacing, extra practice, frequent assessment, and robust monitoring and reporting. Interaction with the online teacher via emails, phone calls, and virtual classrooms is an essential component. Certain requirements are crucial for a successful credit recovery program. Students should dedicate a specific period of time during school, before or after school, at night, on weekends, or during the summer to work on assignments to complete the course. Appropriate technology must be provided to allow students easy and consistent access to their course work. Administrators and guidance counselors must take care in selecting at-risk students and special arrangements must be made to ensure their success. Students must be motivated and able to direct their own learning to fulfill virtual course requirements. A trained course facilitator/mentor must be assigned to each student to provide technical/academic support and proctor exams. A commitment on the part of the student, the parents, and the school administration is essential. Every effort must be made to ensure West Virginia students graduate from high school on time and take their place in the global society. We cannot afford to do otherwise.